Potter Palmer was responsible for much of the development of State Street. He operated an extremely successful dry-goods store in partnership with Marshall Field and Levi Leiter. In the 1860s he withdrew from this business (leasing the building to Field and Leiter for $50,000 a year). He owned 3/4 mile of State street and constructed a number of buildings, including the Palmer House Hotel. In 1871 he married the young and beautiful Bertha Honoré, daughter of Henry Hamilton Honoré. The Palmer House Hotel was newly completed in 1871 when the Great Chicago Fire struck. In a single night, all of Palmer's State Street properties were destroyed. He borrowed $2 million from an insurance company, up to then the largest amount ever loaned to a private citizen, and immediately began rebuilding State Street and the new Palmer House Hotel. Bertha Palmer was considered the queen of Chicago high society, and was a patron of Impressionist artists. The Palmers lived in a Gothic castle at 1350 North Lake Shore Drive, built in 1885. Before the construction of the Palmer home, south-side Prairie Avenue had been the most desirable residential real-estate for the rich, but following Palmer's lead they began building on the "Gold Coast". Mrs. Palmer created a 75-foot picture gallery in her richly ornamented home, collecting the work of French Impressionist painters such as Claude Monet. She frequently entertained such guests as President McKinley. When Mrs. Palmer died in Florida in 1918, her body was returned to her castle beneath a blanket of orchids. 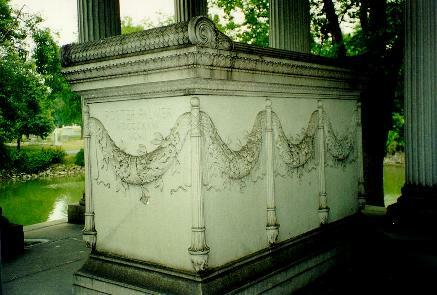 Potter and Bertha Palmer now lie within the two large granite sarcophagi, with the inverted torches on the sides symbolic of death. Three generations of their descendants lie beneath the floor around them. 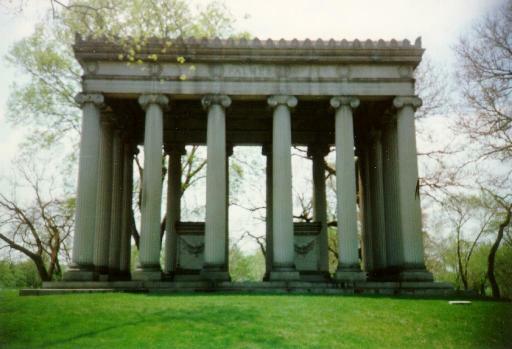 McKim, Mead & White designed their tomb the style of a Greek temple, the largest and most magnificent in Graceland. The burial scene in the movie Damien: Omen II takes place just north of the Palmer monument.